"Dancers are young when they first dream of dance. Siena was six -- and her dreams kept skipping and leaping, circling and spinning, from airy runs along a beach near her home in Puerto Rico, to dance class in Boston, to her debut performance on stage with the New York City Ballet. To Dance tells and shows the fullness of her dreams and her rhapsodic life they led to. Part family history, part backstage drama, here is an original, firsthand book about a young dancer's beginnings -- and beyond." "Big, empty spaces always made me dance. A long hallway or a parking lot just begged for dance...like it wanted to be filled...and I wanted to put dance in it. A big, empty space was always an invitation." 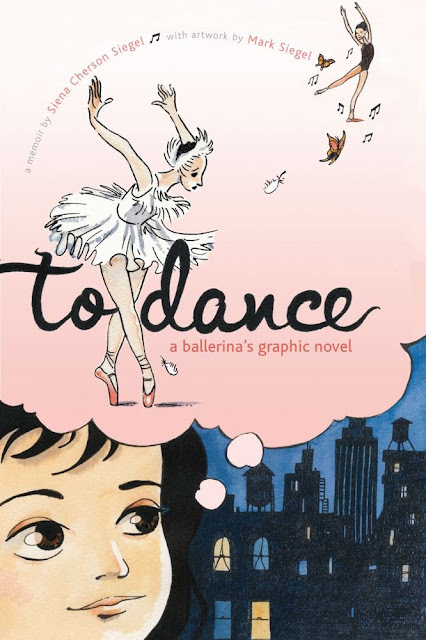 To Dance is a middle-grade level graphic memoir that tells the story of how Siena Cherson Siegel became a ballerina. Born in Puerto Rico, Siegel was drawn to dance when she saw a performance of The Nutcracker. She loved dancing and was able to begin taking lessons. When her parents separate and she moves with her mother to New York, amid her family troubles Siegel continues to dance and is eventually able to study at the School of American Ballet. Siegel's story could be really inspirational to young girls and boys dreaming of a life in the ballet, but the writing in this book is fairly incomplete. Though the illustrations help depict Siegel's childhood, the story lacks the depth of Siegel's life story: audiences don't get the full account, major details are missing, and the conclusion (she stops dancing but then start up again a couple years later) is tacked on without further explanation. This all made the ending a bit unsatisfying. The book is marketed to children grades six to eight, but some readers might be left confused and wondering about what remains unsaid.